Beautiful medieval hamlet dating back to the year 1100 situated in quiet and panoramic location offering enchanting views over the surrounding woods. The hamlet has been recently restored preserving its original architectural features and turned into 5 comfortable apartments, all of which offering charming interiors decorated in typical Tuscan style. The property provides nice furnished outside areas and a round-shaped above-ground swimming pool. The beautiful chestnut and cork woods surrounding the property offer an ideal terrain for relaxing walks along the old medieval paths. Distances: Monticano with all kind of shops 10 km, Siena 28 km, Grosseto 40 km, Florence 95 km. At guests disposal: nice shared equipped terraced garden, round-shaped above-ground swimming-pool (diameter 6 m, depth 1,20 m – open from 15/05 to 30/09). Extra services: shared room available on request for dinners and breakfasts. By arrangement it is possible to organize kitchen classes, bike excursions, horse-back riding and walking (to be booked in advance – max. number of participants 6). 2nd floor: living-room (satellite TV) with kitchen corner, bathroom with shower. From the living-room access via a steep staircase to a loft with double bed (min. height 1,50 m). 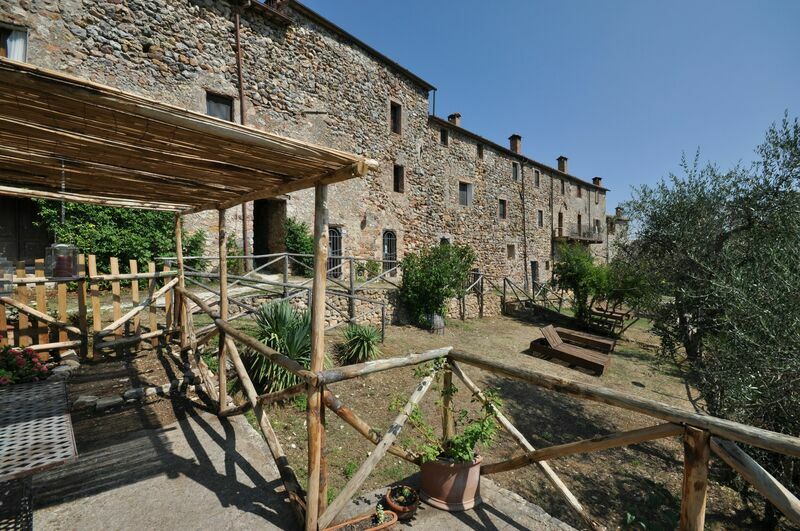 At the entrance there is an equipped covered terrace to be shared with the apartments Castello Vittorio 2 and 4.